Arsenale Editrice, 1990), pp. 16-24 (pp. 20-22). oltras pinturas antiguas de opinion.” See Albert J.
Saggi e memorie di storia dell’arte 25 (2001): p. 86.
as part of the retablo for the high altar of the Escorial. in Brown, Elliot, Sale of the Century, pp. 188-189, no. 22.
his Purchases from the ‘Late King’s Goods’, 16491660,” Journal of the History of Collections 11 (1999): p. 2.
the Veroneses listed on p. 490). See Brown, Elliot, Sale of the Century, pp. 292-293.
vara was equivalent to ca. 84 cm. Pedrocco, Veronese, 2 vols. (Milan: Electa, 1995), II, pp. (1648), ed. Detlev von Hadeln, 2 vols. (Berlin: G.
vols. (Los Angeles: The Getty Institute, 1997), I, pp. 726-786, doc. 109, and pp. 830-877, doc. 115. 1995), pp. 17-22; Haskell, The King’s Pictures, p. 16. Howarth, Lord Arundel, p. 142.
than two wide; Brown, Elliot, Sale of the Century, pp. Madrid, I, p. 472, doc. 49, and p. 844, doc. 115. Elliot, Sale of the Century, pp. 272-273, no. 62. Madrid, I, p. 844, doc. 115. Burke, Cherry, Paintings in Madrid, I, p. 851, doc. 115. Ridolfi, Le maraviglie, I, p. 318. Sixteenth-Century Italian Paintings, Volume I: Venice 15401600 (London: The National Gallery, 2008), pp. may be that listed in the collection of Rubens in 1640. Helena after Veronese,” Master Drawings 29 (1981): pp. Pedrocco, Veronese, II, pp. 330-331. Horace Walpole, Anecdotes of Painting in England, ed. 1662, but none of them had English provenances. Alexander (London, National Gallery), in 1663-1664. See Habert, “Le goût,” p. 311.
with references; Haskell, The King’s Pictures, pp. 16-20. Duke of Buckingham,” Rutgers Art Review 8 (1987): p.
at York House in 1635,” Burlington Magazine 10 (19061907): pp. 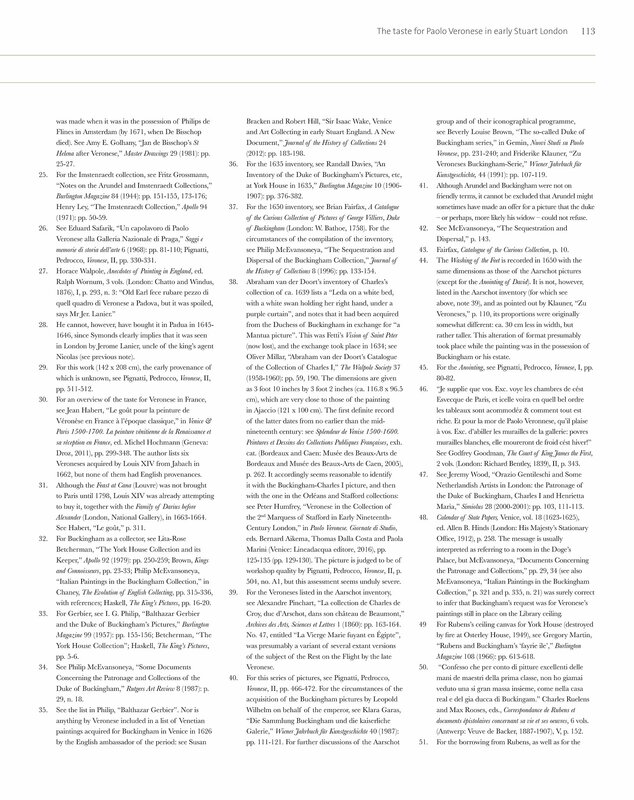 376-382.
the History of Collections 8 (1996): pp. 133-154.
of the latter dates from no earlier than the midnineteenth century: see Splendeur de Venise 1500-1600. Peintures et Dessins des Collections Publiques Françaises, exh. Marini (Venice: Lineadacqua editore, 2016), pp. workshop quality by Pignatti, Pedrocco, Veronese, II, p.
504, no. A1, but this assessment seems unduly severe. Archives des Arts, Sciences et Lettres 1 (1860): pp. 163-164. Kunstgeschichte, 44 (1991): pp. 107-119. – or perhaps, more likely his widow – could not refuse. Fairfax, Catalogue of the Curious Collection, p. 10. For the Anointing, see Pignatti, Pedrocco, Veronese, I, pp. 2 vols. (London: Richard Bentley, 1839), II, p. 343. Maria,” Simiolus 28 (2000-2001): pp. 103, 111-113.
paintings still in place on the Library ceiling. Magazine 108 (1966): pp. 613-618.
documents épistolaires concernant sa vie et ses oeuvres, 6 vols. (Antwerp: Veuve de Backer, 1887-1907), V, p. 152.